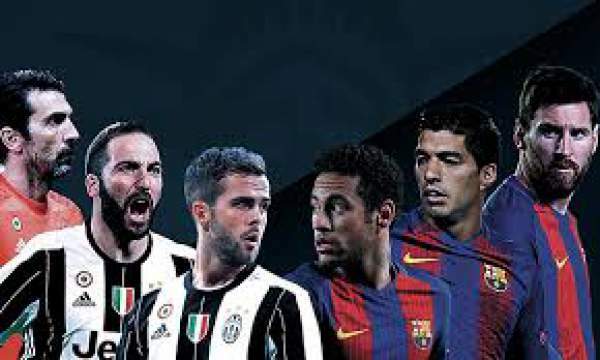 Juventus vs Barcelona Live Streaming Champions League Score FCB v JUV: It is the second game of the quarter-final stage of the Champions league as Juventus hosts Barcelona for the first leg at the Juventus Stadium. Both teams are going strong in their respective leagues and will give their best in this game. Barcelona played against Paris SG and won by 6-5 on aggregate and on the other hand, Juventus played against FC Porto and won by 3-0 on aggregate. Watch: Dortmund vs Monaco Live Stream. Juventus have been going strong in the league as they are the table toppers with 77 points from 31 games, six points above Roma. The have then most expensive striker of all time by the name of Gonzalo Higuain and he has 21 goals to his name in the league so far and three goals in the Champions league as well. Juventus met Barcelona on the 2015 Champions league final and lost the game by 3-1 in Berlin. This is their third quarter-final in their last five Champions league season. They are yet to lose a game in the Champions league this season alongside Real Madrid and haven’t conceded a goal for 351 minutes. They played against Chievo in the league in their previous game and won the game by 2-0 at home. Barcelona were in awe as they lost to 14th placed Malaga in the league by 2-0. They are currently second on the table with 69 points from 31 games, three points below Real Madrid and seven points above Atletico Madrid. Lionel Messi have scored 40+ goals in eight consecutive season. He currently has 27 goals in the Primera Division and 11 goals in the Champions league as well. Barcelona have never beaten Juventus on their home, drawing two and losing two games. They entered the quarter-final after overturning the biggest ever deficit in European cup history. Juventus and Barcelona, both are very strong and anyone can win this. Stay tuned for Juventus vs Barcelona Live Streaming, video highlights, and much more.